I think I’ve mentioned this before, but there’s something about train travel that I absolutely love, specially when it’s long distance. So when I planned to travel from Bangkok to Chiang Mai, I decided to take the over night Express train departing at 22:00. The good part is that it is way more comfortable than the buses from Khao San Road or the Mo Chit terminal in Bangkok. The bad part is that it takes considerably longer at 15 hours versus 9 by bus. Like me, if you’re in no rush, then the overnight train is definitely recommended. If you do want to take this train on a particular date, then it is a must to book in advance, specially during peak tourist season, as this is the preferred way to get to Chiang Mai from Bangkok for a lot of travellers. You can easily book in advance (from anywhere in the world) at the Thai Rail Ticket website. It’s amazing how travel friendly Thailand is. There are 3 travel classes on the overnight Express Sleeper train, Non AC Second class, AC Second Class and First Class. If you like a little bit of luxury, at about 750-850 Baht (depending upon Upper or Lower berth) the AC Second Class Sleeper is great value for money. You are given a clean blanket and pillow, and every berth has a curtain that can be drawn for privacy. There’s also a little reading light in every berth, that I did not need, drifting off into sound sleep after a long tiring day visiting the temples around Banglamphu and Thonburi. I woke up right in time to see the gorgeous scenery. By this time, the train was less crowded. 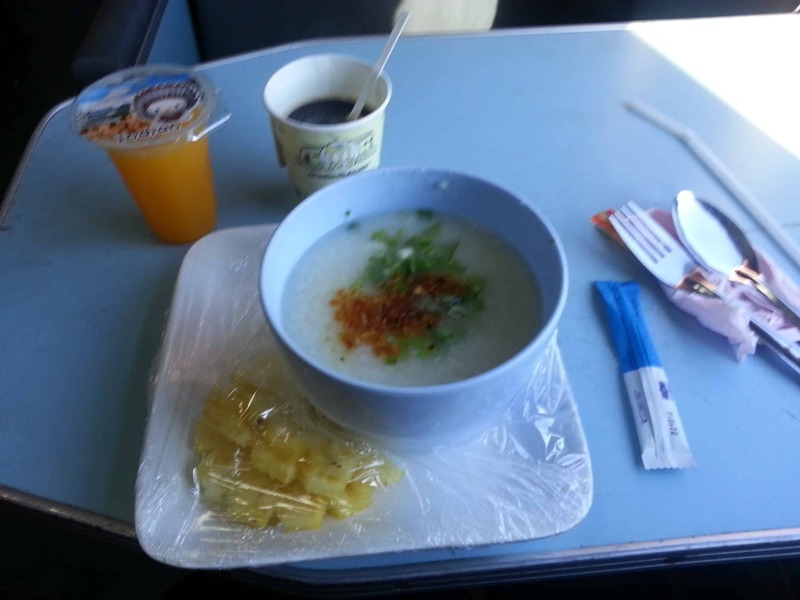 Breakfast bought on board was rice soup with chicken- definitely not recommended but a necessity for my empty stomach. This is a great way to travel, if time is not a constraint, as the scenery arriving into Chiang Mai is truly rewarding. I also think train journeys like these are perfect if you actually want to save up on travel time by travelling comfortably in the night. You end up getting a new experience in the country and save on a night’s accommodation- perfect for a budget traveller. Next articleEating out in Chiang Mai: My top 5! Such a useful post! I’ll be bookmarking this for when I start thinking about how I’ll get from Bangkok to Chiang Mai in December 🙂 Thanks!